A months-long investigation by WAMU reporter Patrick Madden and a team of graduate students from the Investigative Reporting Workshop at American University found evidence that many gun possession cases – nearly 4 in 10 – were dismissed in court, raising questions about police tactics in gun searches. 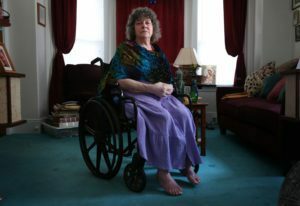 The investigation “Collateral Damage” focused on the impact of the Washington police department’s aggressive focus on confiscating illegal guns. 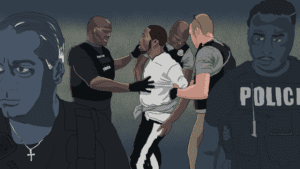 The series – produced for radio, video and web – explored how tactics used by police to search for guns are also angering and alienating residents, especially in the city’s predominantly black neighborhoods where police focus these efforts. Bilingual project looks at immigration policies and outcomes between Guatemala and the U.S.
Grant recipient Maria E. Martin has completed a bilingual web and radio project examining the effects of the Trump administration’s deportation policies on Guatemala. According to her reporting, approximately 200,000 Guatemalans leave for the United States each year. And for the past two years, more than 50,000 Guatemalans have been deported annually. 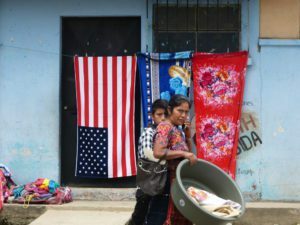 It is estimated that between 1.5 and 2 million Guatemalans live in the U.S. and at least half of them lack legal status. Martin told the stories of deported Guatemalans, both recent migrants and people who had been living and working in the U.S. for decades, in a story for NBC. And in a report for NPR, Martin talked with the director of a migrant refuge in Guatemala who calls the current situation, “a game of pingpong.” He said that 95 percent of deported migrants interviewed by his group will try to return again to the U.S.
Martin also completed a two-part documentary radio project for Making Contact that examined the plight of women migrants and the reasons so many Guatemalans are leaving their country. She also looked at the cost of deportations for the receiving countries, and specifically whether Guatemala is prepared to cope with the tens of thousands of people deported annually by the U.S. Her reporting also ran as a series of audio and written stories on the Spanish-language radio network Radio Bilingüe, covering the cost of lost remittances to Guatemala; the particular dangers faced by women who want to migrate; and deported Guatemalans who try their luck again at returning to the U.S. The Fund for Investigative Journalism (FIJ) is seeking a Director of Operations to help the organization fulfill its mission of supporting freelance and independent investigative journalists. The Director of Operations oversees all office operations and procedures to ensure organizational effectiveness and efficiency and reports directly to the Executive Director. Founded in 1969, FIJ makes grants to journalists who have great tips, ideas, and sources, but need financial resources to accomplish groundbreaking investigations and tell stories that otherwise would not be told. FIJ reviews proposals from investigative journalists three to four times a year, making about 45 to 50 grants annually. FIJ is governed by a board of accomplished investigative journalists who uphold the highest standards of unbiased, nonpartisan investigative journalism. In its field, FIJ is unique as a longstanding organization of journalists that helps fellow journalists, by raising funds to sustain independent watchdog reporting. Promote grantees’ work on FIJ website, through social media, and in newsletters. Write and design brochures that promote FIJ to potential grantees and fellows. Write and design brochures that promote FIJ to potential supporters. Track grantees’ work and outcomes, communicate results to donors and the public. Conduct outreach at journalism conferences and through social media. Communicate with applicants and grantees from their first inquiry through project completion. Facilitate board review of grant applications. Operate programs that provide mentors and pro-bono legal guidance to grantees. Update website frequently to recognize donors. Help develop impact reports and other information to report back to foundations and other donors. Update website content; suggest improvements. Troubleshoot and maintain website, or supervise vendor. Assist executive director with board meeting communications and logistics. Assist executive director with administrative functions. Maintain electronic and paper filing systems; guide ongoing transition from paper to electronic. Maintain office calendar of deadlines for fundraising, partnerships and donor reporting, and grant application and review process. Help write foundation progress reports. Supervise temporary office personnel to keep donor and grantee lists current. Evaluate donor and grantee management systems; recommend improvements. Help organize 50th Anniversary Event. Professional skills required: Strong organizational, writing, and technology skills. Strong interpersonal skills and ability to communicate organization’s mission and fundraising goals to potential supporters, in person and in writing. The ideal candidate would initiate ideas to improve FIJ’s programs and outreach to independent and diverse journalists. Proficiency in Word and Excel. Familiarity with or willingness to learn basic Quickbooks functions. Specific technology requirements: Must have advanced knowledge of WordPress to update Website and troubleshoot occasional issues, ability to generate email newsletters, and use Photoshop or equivalent to edit images. Familiarity with Google Drive, Google Docs, Google Sheets and willingness to learn how to work with Google’s suite of cloud-based applications. Salesforce knowledge would be a plus. General technology requirements: Successful applicant would be the chief technology expert for FIJ, able to juggle technological issues with projects and administrative duties that advance FIJ’s mission. Must be familiar with file-sharing systems. The ideal candidate is experienced in handling a broad range of tasks, is flexible, able to work independently, and desires a part-time position. The candidate may work remotely on occasion. The position is located in Washington DC. Experience: 5 years experience in communications, nonprofit management, and/or fundraising, preferred. Terms: Part-time position (20 hours/week); compensation includes contribution to health insurance plan. The Fund for Investigative Journalism is an equal opportunity employer. Send cover letter, resume and two short writing samples to Sandy Bergo, executive director, at FUNDFIJresumes@gmail.com, with subject heading: Director of Operations position.